The energy and associated economic losses due to soiling on both residential and utility scale PV (photovoltaic) systems can be both significant and avoidable. Losses of up to 5% have been reported which is of interest to system operators. Modules may be cleaned to reduce losses, but this comes with an offsetting economic cost. A quantification of energy losses, and their corresponding economic loss, will allow a determination of a closer to optimal cleaning schedule depending on the level of soiling and corresponding power loss. This will be determined on both fixed modules and single axis tracking modules. Two methods are proposed and compared. Method 1 uses IV curve tracing performed with a Solmetric PVA-1000S PV Analyzer. Method 2 uses direct measurement of energy production on control panels and system panels integrated within the operating system. The two systems are compared to determine the variation between results and whether additional testing apparatus gives results that justify the additional expense. The student will have the opportunity to use the Cal Poly Solar Farm as part of the research and hopefully able to contribute to verifying that its operation is optimal or suggesting ways to improve its performance. It is well known that a cooler photovoltaic cell performs more efficiently when it is cooler. The difficulty has been in finding ways to do this such that the energy required to cool the Solar PV panels is less than the increase in generated energy achieved by doing so. Increased energy production of up to 15% can be achieved if the panel is cooled sufficiently. Students will investigate several cooling methods and determine the improvements gained by each and evaluate the increased performance versus the required energy and materials required to achieve the cooling. Two methods of energy measurements will be used for evaluation. Method 1 uses IV curve tracing performed with a Solmetric PVA-1000S PV Analyzer. Method 2 uses direct measurement of energy production on control panels and system panels integrated within the operating system. Research Project Description: The Cal Poly Solar farm has been built as a single axis tracking facility with two different types of panels. Both conventional single cell solar panels and twin cell solar cells have been used in its construction. Twin Cell panels typically perform better than their conventional counterparts when shaded by other panels in the row in front of them in a fixed tilt system. Backtracking is a technique where the single axis tracker avoids shading other rows by sub-optimally tracking the sun until it is high enough in the sky that this is not necessary. The backtracking algorithm is based on conventional panels. The subject of this research project will be to investigate if there is a better algorithm that would take advantage of the benefits of the TwinCell Solar panel construction. This will be doen through modelling and then implementation on the Cal Poly Solar farm for verification if a superior algorithm is developed. Research Project Description: This project seeks to engage students in an ongoing research effort to grow and characterize cells in situ within a microfluidic system using a variety of metrology methods. Typically, protocols for cell culture arise out of habit, or undirected development based on “what works”. Our lab aims to change that by applying automated, repeatable techniques in combination with rigorous design-of-experiments to develop and optimize cell culture protocols for a range of single cell types and multiple cell co-culture conditions. This project moves us toward that goal by continuing the development of our automated culture and measurement systems. In previous efforts, we have successfully developed individually functional elements such as a heated microscope stage and multiplexed electrical impedance measurement systems. These now need to be integrated with an overall control system to achieve truly automated cell culture and measurement. The three major systems to be integrated include (i) syringe pump systems for cell media delivery/mixing, (ii) cell culture impedance measurement and multiplexing, and (iii) fluorescence cell imaging. Control of these systems will be accomplished by developing a LabVIEW interface. Completion of this phase will be confirmed with automated cell imaging and electrical impedance measurements. Professor Kristen Cardinal’s Tissue Engineering research lab uses electrospinning to fabricate polymer scaffolds for creating tissue engineered blood vessels. The current polymer and model has been used extensively for studies up to 7 days, however recent results suggest that the polymer begins to break down after longer-term in vitro use. It would be beneficial to explore the utility and longevity of other polymers for making scaffolds. Therefore the goal of this project is to select and evaluate new polymers that will be more stable in vitro over time. This will entail selecting new polymer and solvent options, electrospinning tubular scaffolds with new polymers, evaluating scaffold properties after longer-term use, and comparing to the current model. Professor Kristen Cardinal’s Tissue Engineering research lab grows “blood vessel mimics” (BVMs) as early-stage living testing systems for evaluating vascular devices such as stents and flow diverters. Currently, these BVMs are created by depositing smooth muscle cells and endothelial cells within electrospun polymer scaffolds. Although the incorporation of both cell types can be beneficial for some applications, it also complicates the model and can confound the results. It would be beneficial to establish simpler BVMs that may allow more straight-forward assessment of just endothelial cell responses. Therefore the goal of this project is to implement protocols for creating simpler BVMs with only an endothelial lining. Accomplishing this goal will require the selected student to be proficient in cell culture prior to June 2019, and the project will include vessel cultivation, imaging, and image analysis techniques. Research Project Description (One Paragraph): Biopolymers have garnered considerable attention as solutions to the plastic waste accumulation problem in natural environments because of their ability to degrade into non-toxic substances. PHBV is one such polymer that is both bio-degradable and renewable since it is produced through bacterial metabolic pathways. However, this polymer is too expensive for single-use plastic applications. Blending the polymer with Chitosan, a polymer derived from waste shrimp shells, presents an opportunity to reduce cost without impacting the degradation of either material. Such blends have never before been investigated for their potential to degrade in sunlight (i.e. photo-oxidative degradation) or by microbial action (i.e. bio-degradation). Both are important contributors to the overall degradation of plastics found in many environments including oceans, deserts, and other sensitive eco-systems. This project will seek to explore this behavior and establish the suitability of PHBV-Chitosan blends as single use biodegradable plastics. Research Project Description: The goal of the project is to establish the suitability of rolled titanium coil for use in artificial reefs along the Pacific coastline that could be used to both increase bio-genesis and absorb the energy of wave action to diminish beach erosion. The project will include a literature review to establish the current state of knowledge around artificial reefs and wave dissipation, corrosion testing of the coil material for suitability in a sea water environment, and, time-permitting, testing of actual coils in a marine environment near San Luis Obispo for bio-genesis potential and corrosion resistance. Research Project Description: Defect prediction aims at identifying software artifacts that are likely to exhibit a defect. The main purpose of defect prediction is to improve the feasibility of testing and code review, by letting developers focus on specific artifacts only. There are types of variables, such as those in defect and effort prediction, in which prediction intervals can provide more informative and actionable results than point estimates. Recent studies have shown that tuning prediction models increases prediction accuracy. However, to our best knowledge, no study has investigated how to tune, and how to decide how to tune, a prediction model for optimizing prediction intervals. The aim of this project is twofold: 1) we develop and evaluate several validation techniques for tuning a prediction model for optimizing prediction intervals, and 2) we develop and evaluate several meta-validation techniques to determine which are beneficial, i.e., which automatically choose a beneficial validation technique. Research Project Description: The analysis of software engineering repositories has greatly advanced the software engineering discipline. These artifacts are created as part of software development and represent an enormous opportunity for knowledge discovery and theory validation. This proposal aims to develop an extensible infrastructure - RepLab - to facilitate software research that utilizes software project artifacts by combining data sources, software metrics extracted from them, and the associated measurement into self-contained community-maintained packages. RepLab will support repeatability and the validation of theories by simplifying and regularizing data collection, data analysis, and tool integration. Faculty Name: Steffen Peuker, Ph.D.
research project is to perform field measurements using the prototype to determine the energetic and economically feasibility of atmospheric water harvesting. provision of secure communications with increased resistance to natural interference. Such benefit has in turn attracted other industry sectors to look for ways in using SSFM for noise suppression. Power supply companies for example have recently invested in utilizing SSFM into their common power supply topologies that are well known to conduct and radiate significant noise to the surrounding environment. The issue wit hnoise from power supplies becomes critical when these power supplies drive critical communication infrastructure that requires quiet environment. To this extent, many governmental agencies and regulatory organizations have set limits on the amount of radiation that can be emitted by communications equipment. One example of such a specification, CISPR 16-1-3, deals with radio disturbance and immunity measuring apparatus and measuring methods. This research project focuses on investigating the effect of using SSFM in a power supply with multiple DC-DC converters. While the benefits of SSFM are well understood for an individual DC-DC converter, little is known about the effect of extending the use of SSFM in a system requiring several parallel connected DC-DC converters to achieve larger output power such as those used in data servers, microprocessors, and renewable energy systems. Furthermore, this research will also study the impact on noise emission level and efficiency from synchronizing and non-synchronizing the multiple converters while running the SSFM technique using commercially available controllers. systems. Blockchain is in essence a distributed public ledger of all digital events shared among participating parties. Each transaction in the public ledger is verified by consensus and once entered can never be erased. This research will focus on investigating efficient approaches for building blockchain-based frameworks for emerging IoT systems. Industry and researchers expect autonomous ground vehicles (AVs) to be commercially available by 2025 in the United States in the form of private passenger cars and commercial fleet vehicles resulting in a transformation of the transportation industry. This technology requires true multidisciplinary ‘system engineering’ because the performance of AVs depends on vehicle dynamics, electronics, computer software, civil infrastructure, human interfaces, and many more domains. The PI is developing research quality small scale (1/10th scale) sedan and tractor-trailer platforms for research in this field in an ongoing effort through senior projects, independent study, summer research and MS thesis work. These platforms exhibit dynamic similitude similar to full-scale vehicles. They contain ego and environmental sensors to determine the state of the vehicle and its surrounding. An on-board computer platform has been developed that facilitates sensor inputs, and actuator outputs and high-level control development in real time software. Previous work has helped develop these platforms, but to date there has not been significant field-testing. For the SURP 2019 the goal is to use these platforms to conduct necessary field-testing of vehicle dynamics, sensor integration and control design to collect data and characterize the performance of the systems. Implement flight operations procedures for safe, sustainable research. This project will focus on developing a CubeSat specific systems engineering approach for spacecraft development and operations. Students will research and develop a system for mission requirements tracking and standardized supporting evidence for requirements validation to keep missions on schedule and maximize reliability. Additionally, a best-practice procedure for documenting lessons learned will be established in order to help future missions avoid common developmental pitfalls. Finally, a comprehensive mission and system requirements document template will be developed for a realistic CubeSat project, along with the associated verification plans for all requirements. Develop a 3D model of the motion of the leaflets and how this directly relates to the propagation of the action potential down the stem. Using finite element analysis (FEA) software, stress and strain will be analyzed at the cellular level through computational fluid dynamics (CFD). The effects of pressure, and thermal changes on the stimulation of the mimosa plant will be studied through computational heat transfer (CHT). Figure 2. Schematic of Leaf Measurements Along Vein Angle and Fold Angle. The Cal Poly Human Powered Vehicle (HPV) Club develops bicycles capable of traveling 60+ mph (Fig 1). To achieve such speeds, each HPV is designed to maximize efficiency and minimize weight. A key component is the frame, which supports the rider and protects them in the event of a crash (Fig 2). Currently, this component makes up much of the Cal Poly vehicle’s overall weight, and could be better optimized to support its expected loads. We have an interested industry sponsor, Altair, whose topological optimization software offers the opportunity to do just that. This project will explore topological optimization of the frame in an attempt to minimize its weight, while still providing the stiffness and strength required for travelling at highway speeds. In addition, Altair’s AcuSolver will be used to analyze and improve air flow around the fully faired bike in a wind-tunnel style, computational fluid analysis. and microtransit companies (such as Bridj, Chariot, Via). Assemble, program, and test a new BLDS module capable of acoustic data measurement and analysis using MEMS microphones and document its application for wind tunnel testing. Research Project Description: The Copenhagen Network Study consists of data from the cell phones of 800 freshman volunteers at Copenhagen Technical University. This nonpublic data set has been made available to the PI, due to the PI's previous research collaboration with researchers in Copenhagen. The study data set comprises high-resolution social interaction detail, including voice call and text message metadata as well as facebook and twitter activity. We focus our study on the face-to-face contact network, which we infer from the personal interactions described in the raw dataset. We will produce time-series graphs, each one representing a five minute snapshot of social interactions. In each graph, vertices represent one of the 800 students, and two vertices are connected by an edge if the students are within 10 feet of each other during the defined period of time. We believe that this this large, real-world dataset accurately models general social networks and thus offers a valuable research tool for a wide variety of graph theoretic research investigations spanning topics ranging from epidemiology to online-versus-offline behavior. In this study, undergraduate research assistants will collaborate with the faculty advisor to investigate real-world questions. Example questions include: “What is the minimum required measles vaccination rate to prevent an outbreak?” and: “What influence, if any, do physical social patterns have on online social patterns?” Specifically, our research investigation will leverage the PI's previous research in the areas of graph density and subgraph algorithms. Faculty Name: Amelia Greig, Ph.D. Number of Students to be Supported on Research Project: 1 Aero, 1 ME, 1 EE, and 1 CPE. Many potential CubeSat missions are held back by the lack of low-cost, reliable propulsion systems. A propulsion system enables a CubeSat to take a wider breadth of scientific data, maintain an orbit for extended periods of time, de-orbit within a timeframe that meets international regulations, and potentially visit other astronomical bodies. Providing the ability for CubeSats to achieve propulsion in a safe, low-cost, and reliable way expands the capabilities of CubeSats and improves the competitiveness of future proposals submitted by the Cal Poly CubeSat Lab (PolySat). Cal Poly has previously funded a project called Pocket Rocket to research and develop an in-house plasma microthruster [SURP 2018, CPConnect]. This enabled the Pocket Rocket project to realize a completely self-contained CubeSat compatible propulsion system including propellant storage and feed. The development of an onboard RF amplification board for a 1U spacecraft is the final component of new technology development necessary to fully integrate the thruster in a CubeSat. The goal of this research program is to find ways to better optimize the power generation of the Cal Poly solar field. This program has been initiated in collaboration with REC, the solar field managing company. It turned out that the overall power generation of the solar field at this time is lower than what was projected by their model. The plan will be to generate an actual 3-D topography of the site that would include the single axis solar trackers and panels. The 3-D model will then be used to better understand the shading issues they are experiencing due to the uneven ground at the site. The next step is then to use the 3-D model and a standard power generation software, like PVSyst or PlantPredict, to identify possible panel tracking algorithm improvement. This part of the investigation will focus particularly on the morning and the late afternoon when the power generation discrepancies are the most significant. Research Project Description: In this computer vision and avionics focused research project, the goal is to develop a software for situation awareness when having an emergency landing called Emergency Landing Guidance System (ELGS). Intelligent avionics situation awareness electronics started with radar and weather radar and just recently, Ground Proximity warning System (GPWS) and Terrain Awareness and Warning System (TAWS) became standard in cockpits not only for commercial airlines, but also for smaller private planes (sample pictures can be seen at the end of this document). Glide Advisor is another app, calculating the gliding range in case of an engine failure based on plane characteristics, speed, altitude, position and terrain. However, there is no app evaluating where to land, to provide options, risk and hazard awareness. For that, the exact terrain composition must the known. With modern computer vision, we strongly believe to be able to assess the terrain. Taking public terrain maps, we can test every field, grassland, gravel and asphalt road in terms of flatness, bumpiness, hazards (trees, rocks), field-row-direction and current traffic. With the planes characteristic, position and speed, we can further on calculate several landing options, rank them based on risk and provide approach vectors including speed and altitude checks. Research Project Description: Endothelial dysfunction (EnDysTM) has been identified as the most signficant predictor of a Major Adverse Cardiovascular Event (MACE). Arterial compliance is one metric used to quantify EnDysTM via potential stimuli associated with shear rate. An invitro model built using combined fundamentals from Whitt/Drzewiecki and Yong/Geddes previous in vitro models will be built where experimentation will be performed to further explain/define the relationship between shear rate and endothelial dysfunction. Research Project Description: Software development is primarily conducted by humans. Even with the advance of software engineering technologies to support the automation of several tasks, we still strongly rely on human-to-human interaction for performing software development activities and driving results, and that is not likely to change even in the long-term. Developers from one team may collaborate with each other, another team, or independent developers on the other side of the globe. In modern software development, tools such as GitHub and Jira are essential to support not only source code version control but also provide essential features to enhance developer communication and task/time management. However, these tools still lack awareness of human factors such as sentiment and emotion which are at paramount importance in software engineering as they are strongly associated with thinking tasks and problemsolving. Therefore, this project aims at measuring developers’ sentiment and emotion on GitHub public repositories by applying well-known natural language processing tools over developer text such as issue comments and pull request/code review discussions. The exploration of emotional awareness (e.g., sentiment polarity, joy, anger, disgust, sadness, fear) may improve the way software developers communicate to each other, assign tasks, address project issues, make design decisions, review code, and collaborate to coordinate their software development activities better. Ultimately, our stretch goal is to implement a GitHub app to provide sentiment/emotion awareness to software developers in projects hosted on GitHub. To the best of our knowledge, this project involves a combination of challenges and technologies that were never implemented before. data to build recommendation systems that assist developers in software evolution tasks such as code review and bug fixing? In this research, we mainly use machine learning and data mining techniques, natural language processing, information retrieval, lightweight source code analysis, and mathematical quantification. 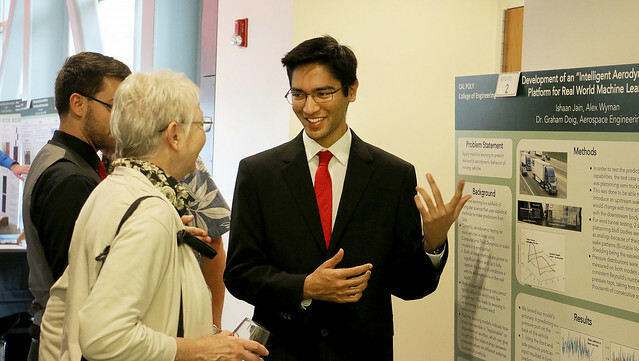 All undergraduate students in the College of Engineering (CENG) are eligible to apply for the 2019 Summer Undergraduate Research Program (SURP). Preference will be given to lower division students (students completing their freshman or sophomore year) who have not previously participated in SURP. Seniors graduating during the 2018 – 2019 academic year or who are entering a Cal Poly graduate program during the 2018 – 2019 academic year are not eligible to apply. How do I select the research topics / faculty mentor to work with? SURP has solicited and selected research project topics from CENG faculty. All selected research topics and associated faculty mentors for SURP 2019 are posted on the "2019 SURP Projects" section above. Please review these research topics and indicate your top three project choices. Also indicate whether you would be open to other projects if your top three are not available. You are encouraged to discuss your application with the faculty mentor of interest. When does SURP start and how long does it last? SURP is an 8-week long program, and SURP students are expected to spend at least 20 hours/week working on their research projects. SURP students and their faculty mentor agree upon a start date for their research project that falls within the summer 2019 quarter. While the 8-week SURP project must be completed during the summer 2019 quarter, the 8 weeks need not be contiguous. SURP students may not use any time worked beyond 20 hours/week to shorten the 8-week duration of the program. Is there a specific application format? Applications are submitted online via the Handshake App (see the "Apply Now!" section below). Applications must include a resume and a cover letter that indicates your top three project choices, as well as why this opportunity is important to you. Also indicate in your cover letter whether you would be open to other projects if your top three are not available. How will students be selected for SURP 2019? Associate Dean Robert Crockett will review the applications and work with the identified faculty mentor to make a final decision and inform the selected student participant(s). What review criteria will apply? Student applications will be evaluated and matched to faculty projects based on the student-project fit, as determined by the student’s resume and cover letter; preference will be given to lower division students (students completing their freshman or sophomore year) who have not previously participated in SURP. The deadline for SURP 2019 application is April 19, 2019. Applications are submitted online via the Handshake App (see the "Apply Now!" section below). When will I know if I have been selected to participate in the 2019 CENG SURP? Associate Dean Robert Crockett will notify the selected students by no later than April 30, 2019. Do I need to do fill out any additional paperwork after I have been selected to participate in SURP? All selected students will be asked to review and sign the SURP participant Commitment and Expectations form. How much compensation will each SURP student participant receive? Each SURP student participant will receive a CENG Summer Research Grant of $3,000. SURP students will not receive additional funding for working more than 20 hours/week or for more than 8 weeks. This grant will be disbursed through the Financial Aid Office. Does SURP provide housing and meals for its student participants? No. SURP student participants are responsible for finding and paying for their own housing and meals for the duration of the program. Can a student receive funding for working on more than one research topic? No. A selected student can receive only one CENG SURP research grant. Can a student participate and receive funding from multiple SURP programs? No. Other colleges at Cal Poly run SURP programs and may permit CENG students to participate. However, students are limited to participation in only SURP program at a time at Cal Poly. Questions should be submitted to Robert Crockett, Associate Dean for Innovation Infrastructure: rcrocket@calpoly.edu (805) 756-2131. Applicants: See the "2019 SURP Projects" section above to view this summer's selected faculty research topics, and indicate your top three project choices, as well as why this opportunity is important to you, in a brief cover letter in addition to your resume. Also indicate whether you would be open to other projects if your top three are not available. Applications are due April 19; selected students will be notified by no later than April 30.